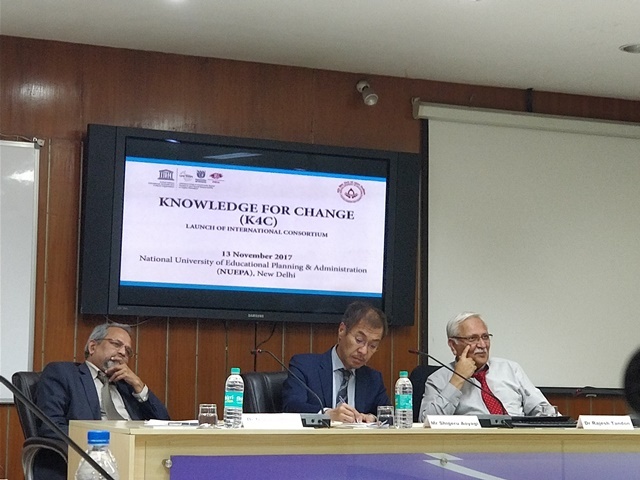 The UNESCO Chair’s Knowledge for Change (K4C) initiative witnessed a grand launch on November 13, 2017 at the National University of Educational Planning & Administration (NUEPA), New Delhi. The launch event, which was hosted in collaboration with NUEPA, witnessed over fifty participants joining the event, which included colleagues from the United Kingdom (UK), civil society practitioners, faculty and students. Joining the discussion were also colleagues from Canada, Indonesia, Italy, Spain and Uganda. Meaningful and insightful discussions ensued at the event, which focused on the relevance of training in community based research, especially in light of the UN SDGs. Dr Rajesh Tandon, UNESCO Co-Chair delivered the opening address as he remarked, ‘there is a disconnect between academic research and the real world. It is amusing to find that the sociology curriculum at Bastar, is same as that in Delhi and Harvard. This raises questions on the local relevance of teaching and research’. He added that during the last 10 years, Community Based Participatory Research has begun to be accepted in academia, and at present, with the focus on UN SDGs, pursuing this form of research becomes even more pertinent. On the relevance of K4C today, he commented that, ‘many people now want to have the capacity to work with communities in a mutually beneficial manner, and K4C is a step forward in this direction and towards fulfilling such aspirations of the next generation of researchers’. The inaugural address was delivered by Mr Shigeru Aoyagi, Director, UNESCO New Delhi, who congratulated the Chair for starting such a path-breaking initiative for training next generation researchers in community-based research, and also compliment the chair as being ‘the most important and active chair in the world’. He added that the SDG agenda is ambitious and calls for the full participation of people. In this context, the focus on Community Based Research and communites as equal stakeholders becomes very important. Mr Aoyagi also committed the full support from UNESCO’s end, towards the K4C initiative, and wished it the best for the future. 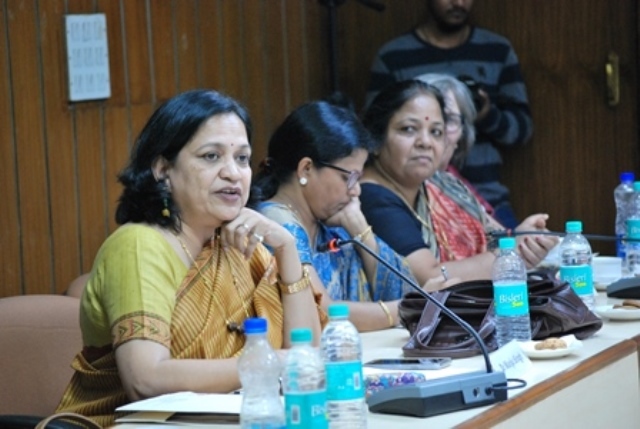 One of the key speakers at the event were Dr S K Pandey, Vice-Chancellor, Pandit Ravi Shankar Shukla University, who emphasized the importance of universities being connected to the society, to remain relevant in the future and said that community based research is an important tool to ensure this happens. 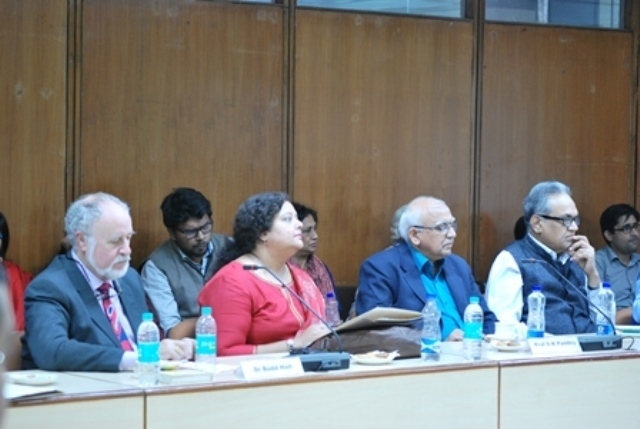 Professor Pandey remarked that ‘it is gratifying that in the era of globalization, K4C seems to take knowledge from the connected to the unconnected, and also help in making universities responsible towards its society’. He emphasized on the ‘humanistic’ aspect of universities, much beyond its mandate of handing over degrees. He commented, ‘the society does not only view us a temple of learning, but there is also a certain amount of hope, which the society has in us. Keeping this in mind, we should ensure that whatever we do, it has a positive and visible impact on the society’. He also said that unless the academia makes efforts to remain relevant to the society in the contemporary times, it faces the risk of perishing in the long run. Dr Darren Brendan Lortan, coordinator of the South African hub under K4C emphasized the need to take science to a place where it is underrepresented. He added that, ‘while money flows from the outside to the universities, community engagement should be one channel where the flow is in the opposite direction’. Dr Manju Singh, coordinator from Manipal University, Jaipur (part of the Indian hub) shared about how knowledge had the capacity to transform the lives of the communities, and also the power to change the society as a whole. She also reflected on the unfortunate reality of our current research system, where although researchers complete complex dissertations, with fancy models and presentations; they are however, at loss of words, when queried about the ‘meaningfulness or relevance of their work’. Dr Singh commented that ‘we know that the world is not okay. To make things better, we need innovative ways of thinking, and K4C is an excellent attempt in this direction, as it will help find solutions to challenges at local, regional, national and global level’. She shared her experiences from Manipal University as to how the subject on analytical research in the first semester of undergraduate courses, seeks to make the connect with local realities and develop related skills in the students. She added that the University is excited to be a part of K4C, and has already zeroed down on the mentors participating in the first cohort, coming from backgrounds like planning, architecture, mechanical engineering and sociology. Dr Andrea Vargiu, coordinator of the Italian hub, joined his fellow colleagues in expressing his delight to be associated with the initiative. Sharing his European experiences, Dr Vargiu added that, ‘back in Europe, there is a lot of emphasis on research based policy, and it is here that K4C can play a critical role in adding value to policies from global dimensions’. Commenting on the varied contexts that K4C will bring together, Dr Vargiu said that ‘it is a unique opportunity for us to learn from global experiences, and connect the local with the global, by bridging disciplinary gaps in the academia’. He added that the ‘unique selling point of K4C is that it is not a ‘project’ based consortium’, but a ‘principle and value’ based initiative, not meant to end anytime in the near future. Dr Mousumi Mukherjee, coordinator of O P Jindal Global University, Sonepat (part of Indian hub) stressed on the need to focus on epistemological issues in the current times. She said that, ‘Through K4C, we will be able to develop a body of knowledge on global problems, through researching on local challenges and issues. 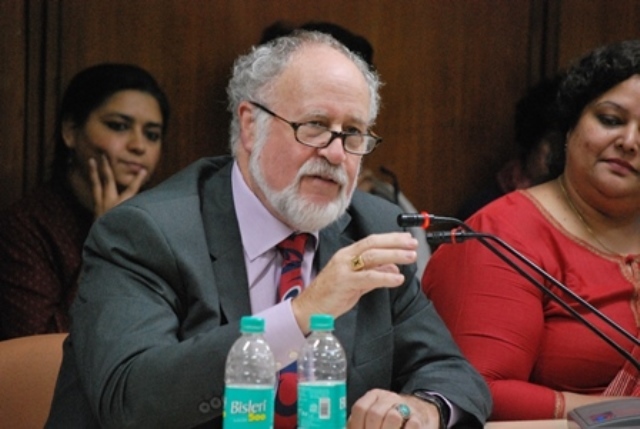 Dr Budd Hall, Co-Chair, UNESCO Chair, began with the mention of Shri Mahatma Gandhi and his focus on ‘Antyodya’, which refers to the ‘last person’. He said that, ‘the measure of our social responsibility is linked to the degree to which we are able to support the life of the ‘Antyodya’. He added that, ‘this is in essence is the spirit of the K4C consortium, that is, to reach to the Antyodya from knowledge perspectives’. Dr Hall reflected on history of the last 550 years, which has witnessed massive epistemicide of so many traditional knowledge systems, because of colonization. This has essentially rendered invisible, the richness of the knowledge possessed by the Antyodya. However, the world is slowly beginning to realize the ills of colonization, and the various decolonization movements across the globe, bears testimony to this. Dr Hall reflected on our role, as he remarked, ‘we are knowledge workers, working in the spirt of recognizing knowledge connections in relation to the Antyodya’. 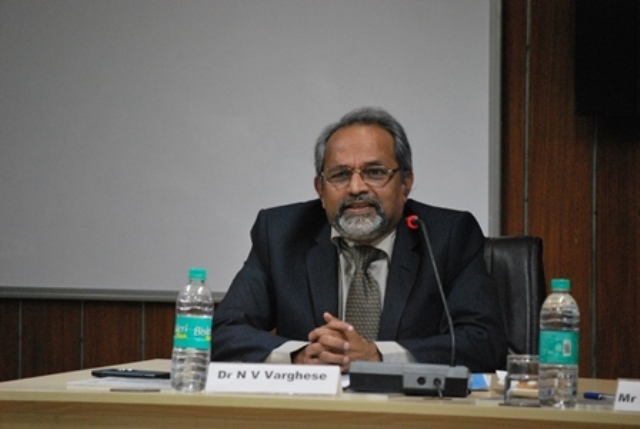 The launch event closed with an address by Prof N V Varghese, Vice-Chancellor, NUEPA, who emphasized the importance of societal engagement in research. Prof Varghese however, stated that, ‘one of the main difficulties we face when we try to link education with society is when we find that the two are completely divorced’. Adding fuel to fire, is the thought process of most higher education institutions who do not take the linkages between higher education and societal development, seriously, where development was only viewed from the lens of economic and industrial development’. He however added that recently, this way of thinking has changed and today, knowledge is being looked up to as important and critical for holistic development. He added that in light of the SDGs, an even important question for us is to find ways to remain globally competitive and locally engaged at the same time. Prof Varghese said that, in order to seek answer to this question, ‘we need to invest in and work towards social responsibilities for relevant knowledge creation and also ensuring social accountability of institutions’.